A private manned Mars mission may get some help from students on its way to the launch pad in 2018. A newly announced contest asks students to propose design concepts for the Inspiration Mars mission, a private effort that aims to launch two astronauts on a flyby of the Red Planet in January 2018. 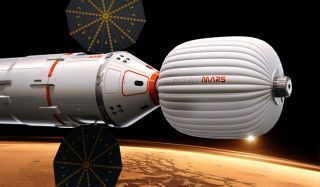 "Inspiration Mars is looking for the most creative ideas from engineers all over the world," Dennis Tito, executive director of the nonprofit Inspiration Mars Foundation, said in a statement Friday (Aug. 16). The competition, which is organized by the nonprofit Mars Society, challenges teams of university students from around the world to design a two-person 2018 Mars flyby mission as cheaply and safely as possible. Teams — which can include university faculty and staff members, but not in a leading role — must submit their proposals by March 15, 2014. The top 10 concepts will be presented to a panel of judges a month later during a public event at NASA's Ames Research Center in Moffett Field, Calif., Mars Society officials said. First prize is $10,000, along with an all-expenses-paid trip to the Mars Society's 2014 conference. The second- through fifth-place teams will receive $5,000, $3,000, $2,000 and $1,000, respectively. "The Mars Society is delighted to lead this effort," Mars Society president Robert Zubrin said in a statement. "This contest will provide an opportunity for legions of young engineers to directly contribute their talent to this breakthrough project to open the space frontier." Inspiration Mars seeks to launch one man and one woman — preferably a married couple — on a 501-day roundtrip journey, punctuated by a close flyby of the Red Planet in August 2018. The mission would not land on Mars but would zip within 100 miles (160 kilometers) of the planet's surface, officials say. Tito has committed to provide two years of funding for the mission, which was announced in February. Inspiration Mars officials hope to foot the bill the rest of the way by soliciting donations and securing media and naming rights, among other strategies.